This dissertation analyses developments in the international regulation of foreign direct investment (FDI). The international legal framework of investment encompasses numerous binding or non-binding legal instruments, including customary international law, bilateral investment treaties, and international organizations’ decisions and resolutions. The rules established by the international legal framework become effective and significant when they are able to be adapted by appropriate and compatible domestic law frameworks. Through analyzing the Turkish foreign investment regulations and policies, this study concludes that there is a successful and complex interaction between international rules and domestic rules on FDI. Like many developing countries, since the 1980s Turkey has revamped its FDI regulations in response to changes and developments in international investment law. This interaction will reach its culmination, if there is a comprehensive multilateral agreement on investment. 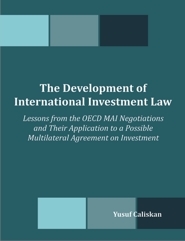 This dissertation examines failures of the OECD MAI draft treaty since there are lessons to be learned from the MAI negotiations. Thus, it makes some recommendations both in relation to the substance and the procedure for a possible future negotiation of multilateral investment agreement.